Consumables are items in the World of Warcraft that your character can consume to gain buffs and as a Disc Priest, enhance your healing abilities. For Disc Priests, there are basically 2-3 consumables that are going to benefit you. Use these consumables to get the most out of your healing and keep those health bars full! It’s worth noting that consumables are not always required unless you’re raiding harder content and can’t keep up with the damage or have just started playing and need that little bit of extra help. Normally for dungeons and the “Looking For Raid” raids, you will most likely not need these consumables. It’s also worth noting that you cannot double up on flasks and elixirs. You can only have one beneficial buff from flasks or elixirs at one time. Drinking a new flask or elixir will overwrite the previous flask or elixir. You have a couple of different options for potions (or pots) depending on your situation. Remember, you can only pot once during an encounter, so choose wisely. For a greater mana return, through channeling – Draenic Channeled Mana Potion – note: you cannot move while channeling this potion, use during a lull in the encounter. These are made by Alchemists and your character consumes them to gain specific buffs. You can buy them from the Auction House(AH), other players, or you can become an Alchemist yourself. To learn more about professions for Disc Priest, head to the Disc Priest Professions page. This flasks boosts your number 1 stat Intellect by 114 for 1 hour, increasing your overall healing by a marginal amount. It will most likely be the more expensive flask to buy/create, but is by far the best. This flask boosts your Spirit by 114 for 1 hour and is good should you have trouble with running out of mana. If you’re running out of mana during encounters and can’t gain more spirit through enchanting, gems or reforging, this may help you get there. Like flasks are made by Alchemists. This flask increases your Spirit by 85 for 1 hour. Should be a cheaper option than the Flask of Falling Leaves. Increases your Mastery by 85 for 1 hour. Useful should you be aiming for more Mastery over Intellect and you’re not running out of mana. Potion of Focus – A good potion for returning mana back to at down times in an encounter. You must be still for 10 seconds to get the full benefit. Returns mana over time. Potion of the Jade Serpent – Another good potion that temporarily boosts your intellect (and therefore your heals), allowing you to heal through damage. A good option if you’re not running out of mana. Master Mana Potion – Another mana return potion, but doesn’t require you to stand still and returns mana instantly, however doesn’t return as much as Potion of Focus. Banquets are made with the cooking profession and can be used to set up a table that everyone in your party/raid can eat & drink from, gaining buffs just like foods. 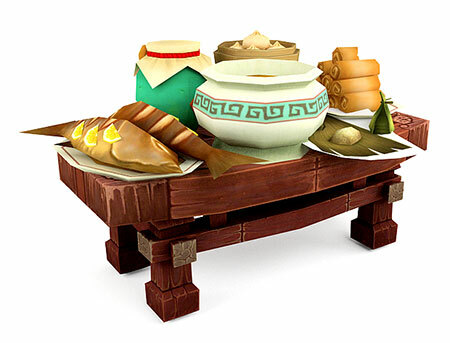 Pandaren Treasure Noodle Cart Kit – Put this down and anyone who drinks from it will gain a beneficial stat of 34. Food is created by cooks, which is a secondary profession that anyone can obtain. You can also purchase these items off the AH(Auction House). Again, like flasks and elixirs, you can only gain 1 buff from food. Eating a different food that grants a buff will overwrite the old food you ate that grants a buff. Mogu Fish Stew or Spiced Blossom Soup – Always a great buff to have, unless you’re running out of Mana. Increases your Intellect by 34 for 1 hour. Mango Ice – If you’re interested in more Mastery over Intellect or Spirit. Increases your Mastery rating by 34 for 1 hour. Steamed Crab Surprise – A big help if you’re running out of Mana. Increases your Spirit 34 for 1 hour. Braised Turtle – If you can’t afford Mogu Fish Stew, it’s always a great buff to have, unless you’re running out of Mana. Increases your Intellect by 31 for 1 hour. Fire Spirit Salmon – A big help if you’re running out of Mana and can’t afford Steamed Crab Surprise. Increases your Spirit by 31 for 1 hour. Swirling Mist Soup – A good buff to your Intellect if you can’t afford the 2 superior foods, unless you’re running out of mana. Increases your Intellect by 28 for 1 hour. Shrimp Dumplings – Somewhat helpful if you’re running out of Mana and can’t afford the 2 superior recipes. Increases your Spirit by 28 for 1 hour. Pearl Milk Tea or Grilled Dinosaur Haunch – If you’re interested in more Mastery over Intellect or Spirit. Increases your Mastery rating by 23 for 1 hour. Roasted Barley Tea – A cheaper, less effective alternative to the Pearl Milk Tea. Increases your Mastery by 11 for 1 hour. Originally published on December 4th, 2012 by Disc Priest on HealingWoW.com, Last modified: June 8th, 2016 .